Eight victims share their stories. Part of Wiriadjaja’s response was to blog about his recovery, including a series of photos displaying his scars. His medical and mental-health treatments have totaled about $169,000, most of which have been covered by his health insurance. Still, his deductibles and other out-of-pocket expenses cost more than $20,000 and ate up all his savings. For a while, he says, he had to couch-surf with friends “while my insides were still sloshing around.” He was told that he was eligible for reimbursements from the state’s office of victim services, but the process was so daunting on top of his recovery and return to work—”like adding an extra full-time job”—that he decided to move on. Today, Wiriadjaja is an assistant arts professor at New York University in Shanghai. “I know I’m lucky, because I had savings, health insurance, and an incredible support network,” he says. 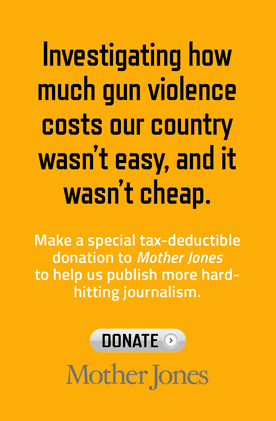 “Many other gunshot survivors are not. I count my blessings every day.” The man who helped save his life on the street was shot and killed in South Carolina last year. On May 27, 2010, Kamari Ridgle had just left a liquor store in Richmond, California, when a car pulled up behind him and shots rang out. He was hit 22 times before the perpetrators sped off. Ridgle was 15 years old. “When I was shot, I was that kid in and out of juvenile hall,” he says, describing his time as a drug dealer. 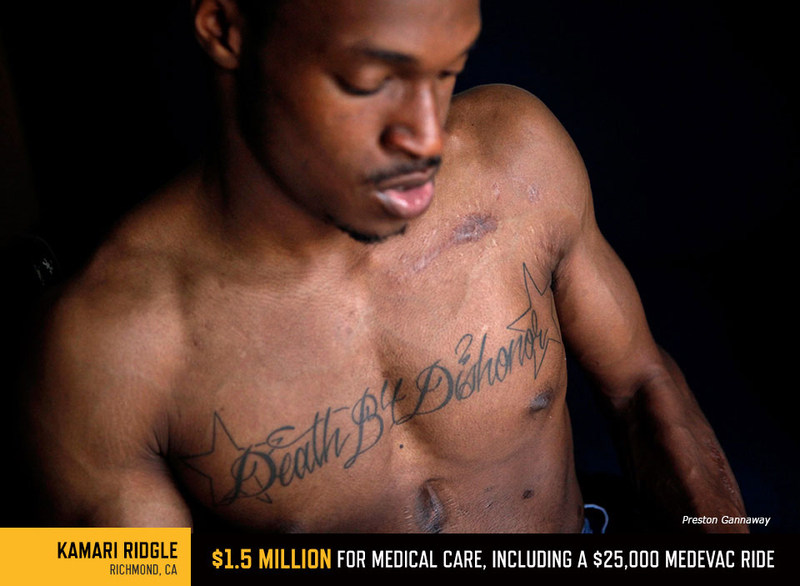 “You develop a name, and people don’t like you.” The gunshots shattered his elbow, mangled an arm, damaged his intestines and liver, and tore through his spine. He was transported by helicopter to a nearby hospital, where he underwent multiple emergency procedures. He would have a dozen surgeries, including some later to remove bullets. It was nearly a year before he rolled out of the hospital with his wheelchair and a colostomy bag. Medicaid covered most of his costs. Three men were tried for attempted murder in connection with the shooting. All three received long prison sentences. On February 20, 2014, during a tribal council meeting in Alturas, California, a woman named Cherie Rhoades, angry about an eviction proceeding, walked in with two 9 mm handguns and opened fire. After one gun jammed and the other ran out of bullets, she pulled out a butcher’s knife and began stabbing people. Two people were critically injured and four died. Shelia Lynn Russo, a 47-year-old administrator, was among those shot and killed. Philip Russo, her husband, was a part-time correctional officer at the local county jail. After Rhoades was taken there on the day of the shooting, Russo was told he could no longer guard the building—for Rhoades’ safety. Not long after, Russo was laid off. Shelia had earned the majority of their household income, about $60,000 annually. 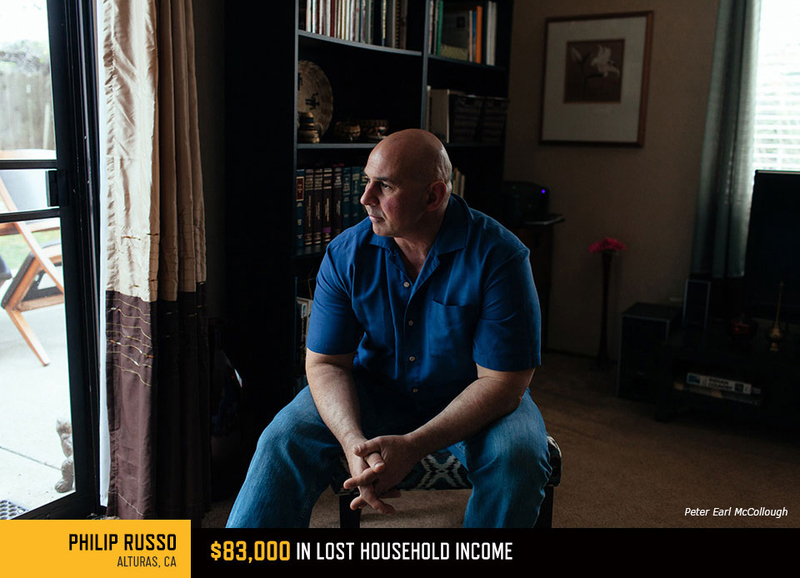 Russo lived off savings while he looked for a new job; he now works as a security guard at a medical center in Redding. “I waited my whole life to meet someone like Shelia,” he says. “Then all too quickly she was gone.” He has become an advocate for tighter firearm regulations and for survivors of gun violence: “I knew that I wanted to get into victims advocacy because I so desperately needed it, and there seemed to be a great lack of it,” he says. His wife’s suspected killer has pleaded not guilty to four counts of murder and two counts of attempted murder. The trial is expected to begin in 2016. On April 4, 2006, in a neighborhood on Chicago’s South Side, Pamela Bosley’s 18-year-old son, Terrell, was unloading a drum set from a van in preparation for a church choir rehearsal when a man walked up and opened fire on him and his bandmates. Terrell was rushed by ambulance to a nearby hospital, where he died a few hours later. He was one of Chicago’s 384 gun homicide victims that year. Bosley describes Terrell, then a college freshman and the oldest of three siblings, as “my outgoing son.” He was a starter on his high school football team, had performed as the lion in a school production of The Wiz, and played bass in jazz and gospel bands. He’d planned to major in music and tour the world. The few hours when Terrell clung to life in the hospital cost about $10,000, which was mostly covered by the family’s health insurance. Later, Bosley spent thousands of dollars out of pocket on therapy and antidepressants for herself and another family member, who was hospitalized at one point for depression. Bosley also lost several thousand dollars in earnings during a six-month leave of absence from her operations job at a bank. * She twice attempted suicide. “I could be okay one hour, then the next minute I could look at something and be broken down,” she says. She regained some balance, but when she returned to her job, her coworkers’ chatter about their kids, and her memories of Terrell visiting her at work, were too much to bear. She took a job at another bank. 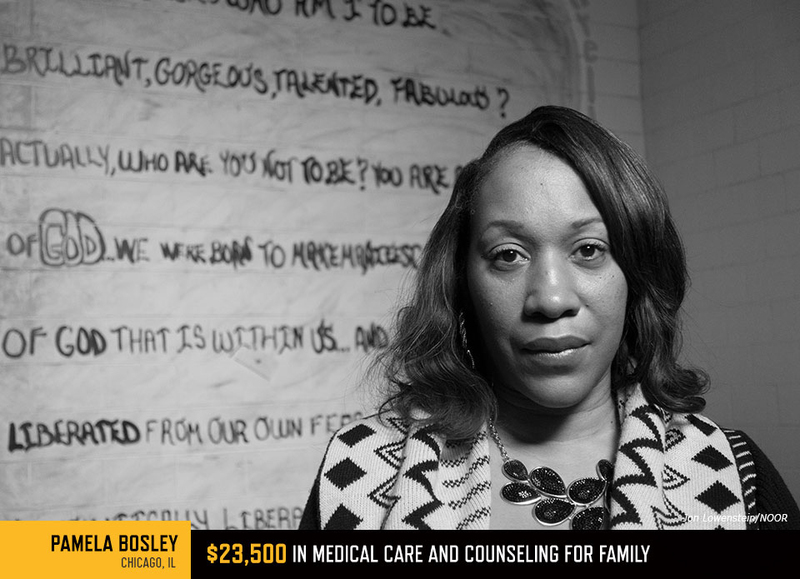 In 2007, Bosley and her husband started a service to help gun violence survivors join support groups. Her second son is planning to become a medical engineer, and Terrell’s youngest brother—who was just eight at the time of Terrell’s death and used to pray nightly that no one else in his family would get shot—is now a thriving high school junior. But justice has been elusive: In 2008, a man was charged in connection with Terrell’s murder, but prosecutors lacked sufficient evidence, and no one has been convicted. In the days following Brett’s death, representatives of the Cheyenne Police Department’s victim assistance program came to the house to remove the blood-soaked carpets and chair. They also helped clean Brett’s favorite cowboy hat, which he’d been wearing that day. Four years later, his older brother Beau, 26, took his life with a gun, leaving behind a girlfriend and their one-year-old son. Beau had worked in construction for the state, and his salary of about $37,000 had been the primary source of income for his young family. On the night of December 11, 2010, Paris Brown was at a bingo hall when one of her sons called to tell her that someone had just shot Dominic, the fourth of her seven children. As she ran out to her car, she burst into tears—earlier that evening, Dominic, 19, had handed her a gift for her birthday and told her he loved her. The next time she saw him, he was sprawled on the pavement at an intersection in East Oakland, surrounded by police cars. Brown called the Oakland Police Department every few months to check on the status of the case. In 2013, detectives told her that they’d identified a suspect in Dominic’s murder, but that there wasn’t enough evidence to prosecute without a witness stepping forward. No one has done so, and Brown no longer wants to focus on it. 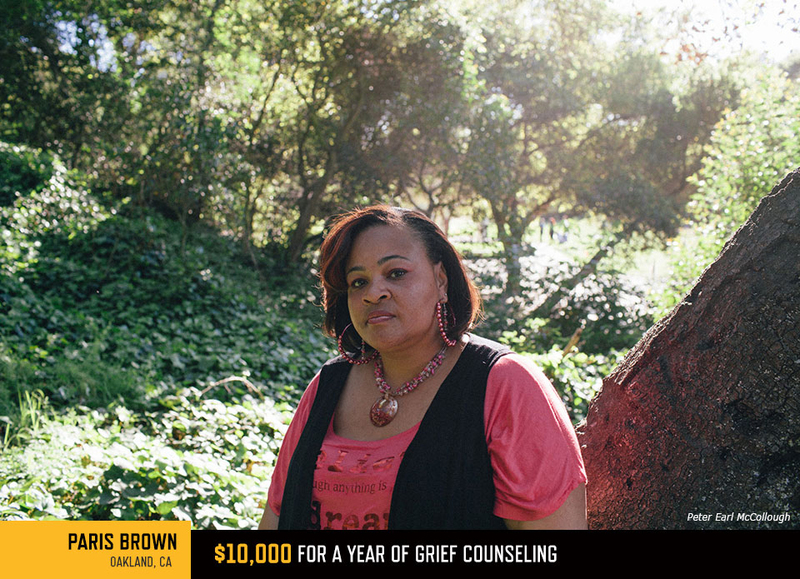 “Let God handle it,” she says, “I stress about it enough.” Over the past decade, a majority of gun murders in Oakland, which consistently ranks among America’s most dangerous cities, have gone unsolved. On the evening of November 15, 2004, Jennifer Longdon and her fiance pulled into a strip mall parking lot in Phoenix to get some dinner when a truck sideswiped theirs and a man got out and began shooting. Her fiance took a bullet through the brain that left him profoundly impaired. Longdon was shot in the spine and left paralyzed from the chest down. The physical devastation was followed by financial ruin. 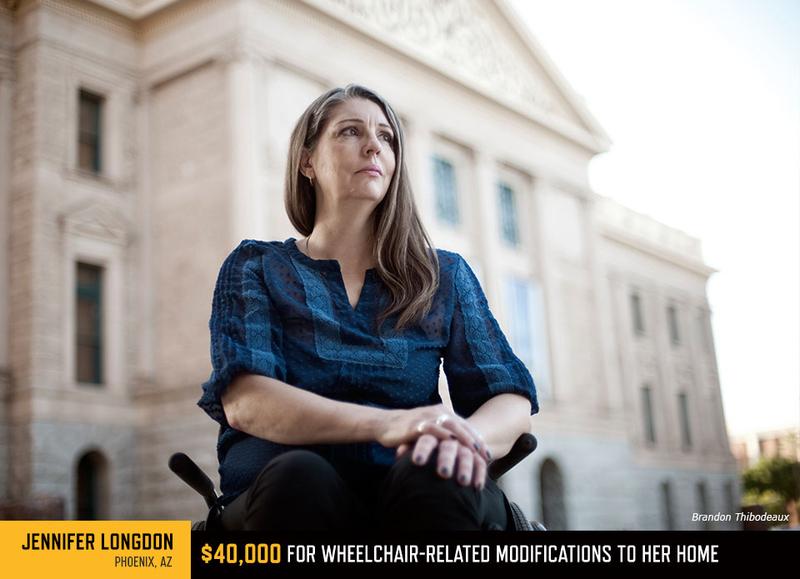 Longdon, who lost her health insurance shortly after the shooting, has been hospitalized at least 20 times over the past decade. One especially bad fall from her wheelchair in 2011 broke major bones in both legs; she came close to having them amputated and had to have titanium rods inserted. There was also the $40,000 in modifications to her home, just so she could wheel through the front door, make dinner, or take a shower. And the $35,000 for a custom lift-equipped van (and the steep insurance rates that came with it). 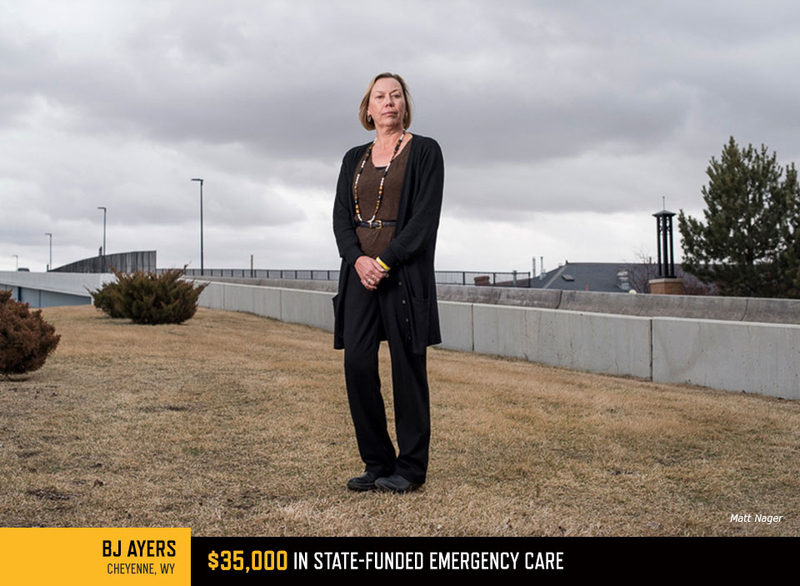 “I don’t think people understand the way nickels and dimes add up to hundreds of thousands of dollars—millions of dollars—over the lifetime of an injury,” she says. 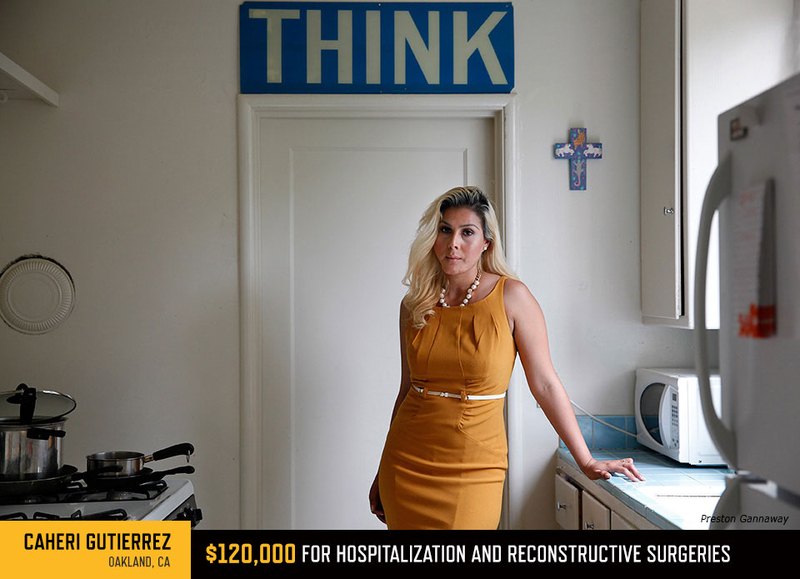 Shortly before 9 p.m. on November 20, 2008, 18-year-old Caheri Gutierrez sat in the passenger seat of a friend’s car at a stoplight in Oakland, on her way to a part-time office-cleaning job. It may have been from a nearby gang incident: Suddenly a single bullet hissed through the window and struck Gutierrez through the jaw. She spent the next month in the hospital undergoing multiple procedures, including surgeries to reconstruct her facial bones and install dentures. Medicaid covered most of the $120,000 in costs. In a psychological assessment shortly after the shooting, a social worker wrote that Gutierrez was “remarkably strong and resilient” but “unable to speak” and “communicates through writing.” When the police came, Gutierrez scribbled down that she had no idea who had pulled the trigger, or why. The case wasn’t solved. Her hospital stay was followed by many months of physical therapy and counseling. Gutierrez had also worked in retail before the shooting, but now she struggled to find a customer service job. “I felt like employers didn’t want to hire me because the scars were so prevalent,” she says. *Bosley’s job title has been corrected.